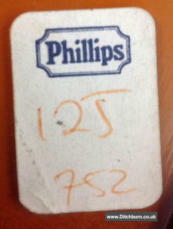 Our story starts way back in 1995 when one of my customers mentioned in conversation that he had been to view a forthcoming Phillips auction in London. 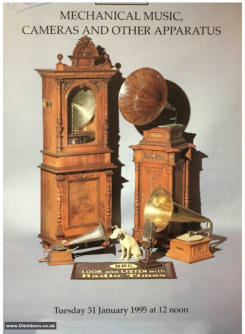 The catalogue description was for mechanical music, cameras and other apparatus to be auctioned, and there were a couple of Jukeboxes amongst the lots, one of which was a Jack Hylton Music Maker. I had seen a picture of the Music Maker in one of the books on Jukebox history and I knew it was the first of its kind, so I decided to have a crack at LOT125. I got the machine back to my workshops in Sheﬃeld where I took a few photographs, but then it got moth-balled and put into storage for as they say…. for a rainy day. 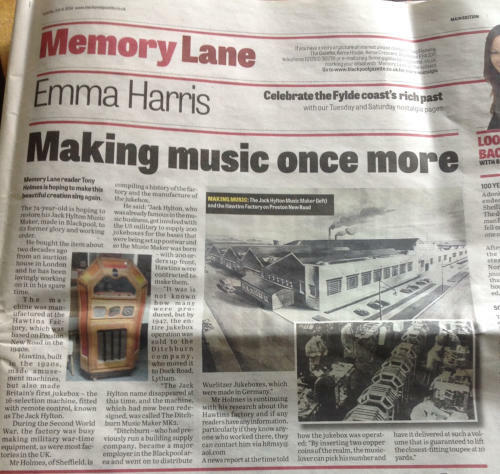 During the next few years I was able to do some further research as I was writing for Jukebox Collector magazines, and came into contact with a lot of other enthusiasts and some interesting long lost material, and the story of how the Music Maker was born started to emerge. 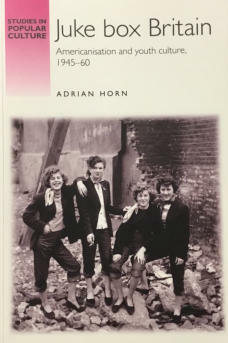 A chap called Adrian Horn was writing a book called JUKE BOX BRITAIN and he had access to the Jack Hylton archive which is held at Lancaster University so a lot more detail was forthcoming as to how the machine came to be built. There are details about Jack Hylton and the Ditchburn connection elsewhere on this site so I intend to document the restoration of LOT 125 with lots of photographs showing all the stages. We move on now about 20 years, the machine has been moved to my home and is still mothballed in the garage, by this time I have retired and sold my business so no excuse now? You may have noticed in the original auction listing that the Hylton came minus its speaker and worst of all the original amplifier Well during this 20 year gap, I had acquired the proper amplifier and had it safely stored away. In my research I discovered that the initial contract with Hawtin’s was to make 300 machines the serial number on mine is 488 so i am not sure how significant that is. What I did not know until recently was that Hawtin’s only made the machine for about a year and also had started development of a MK2 version although it is not clear if the MK2 ever got past the prototype stage, the only image of this version is an artists impression of what it was to look like, there is also a newspaper report about a trade show that states both models i.e MK1 and MK2 were displayed together on the stand. 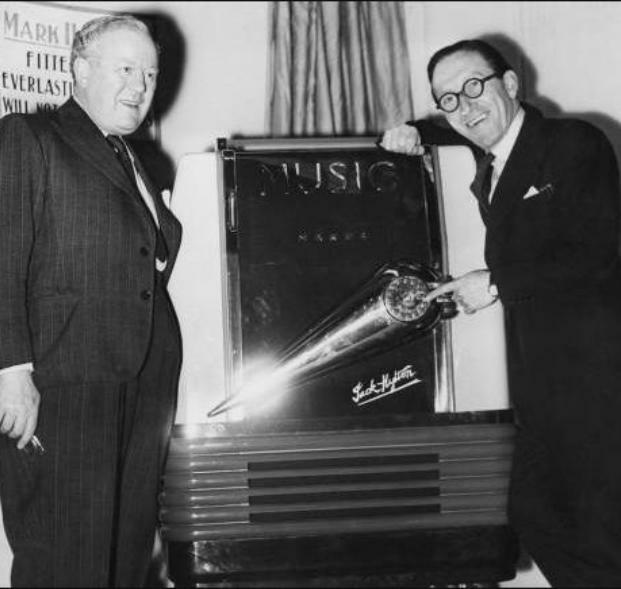 Editors Note: We do have this picture (Left) of a MK2 console baring the Jack Hylton name, this photo was published 11th Feb 1946 with Jack Hylton and Arthur Askey at its side, It was taken at an amusements trade exhibition, but this is the only known photo of a MK2 during this time, that we are currently aware of. Tony Holmes, is a well respected authority on all things Juke box, he was the the original proprietor of the well known UK company “The Juke Joint”, Tony is a legend among UK jukebox collectors, he has been restoring, repairing and writing about classic jukeboxes since the 1970's. 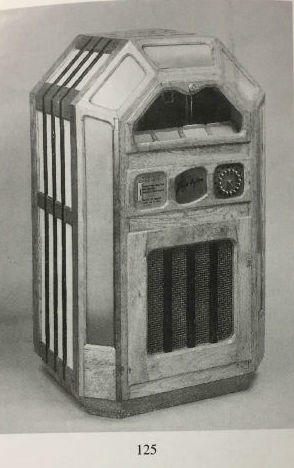 and we welcome him to the Ditchburn Project to discuss and share how he acquired his only known surviving Jack Hylton Music Maker MK1 Jukebox.